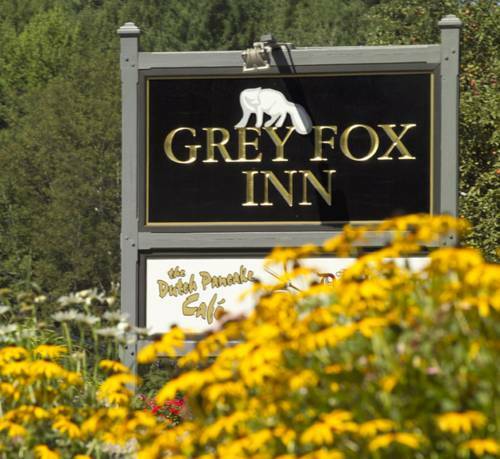 With some of the most spectacular views in the village The Grey Fox Inn offers its guests a sophisticated atmosphere and a great location right in the heart of Stowe. Wide variety of accommodations and amenities. Contemporary rooms with balconies and cozy inn facilities. Enjoy indoor and outdoor pools fitness center hot tub and sauna game room Pub and entertainment lounge. Home of the Dutch Pancake Cafe. Adjacent to the recreation path. Romance family and value added seasonal packages available. All Rooms have Free WiFi Phone CoffeeTea maker Clock Radio Iron and Board Hair Dryer Cable TV AC and are NonSmoking. Some Rooms have Fireplace Refrigerator Jacuzzi Tub Kitchen DVD and are Handicap Accessible Front desk is open from 8 AM to 10 PM off season and 8 AM to 5 PM in season. Indoor Pool sauna and hot tub hours 8am 9pm Guests arriving after hours must use Main Inn front entrance phone for instructions.